Preheat the oven to 425°F. 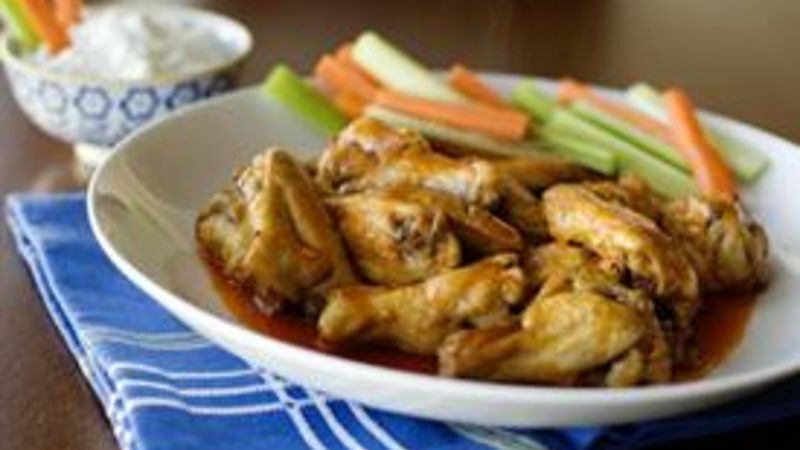 Place the chicken wings in a large bowl. Add the vegetable oil, garlic, salt, pepper, and cayenne. Toss to coat completely. Line a baking sheet with foil and place the chicken wings in a single layer. Bake for 25 minutes or until just done. In a large bowl, mix together melted butter, hot sauce, honey, and vinegar. Add the cooked chicken wings and coat completely with the hot sauce. Mix together the sour cream, blue cheese crumbles, vinegar, green onions, salt and pepper. Serve with the chicken wings.